There's the usual mixture of triumph and tragedy in the garden this year. The mice have had almost all the allotment strawberries. I think I shall take them out. I spent ages nurturing them last year and netting them this year, all to no avail. Every berry has gone now, ripe or unripe. I found piles of them rotting gently underneath the broad beans. Frustrating. The ground will be better used for something else. The garden strawberries have done quite well though. They're nearly at an end now. I haven't made any jam but we've had more strawberries and cream than you could shake a stick at. 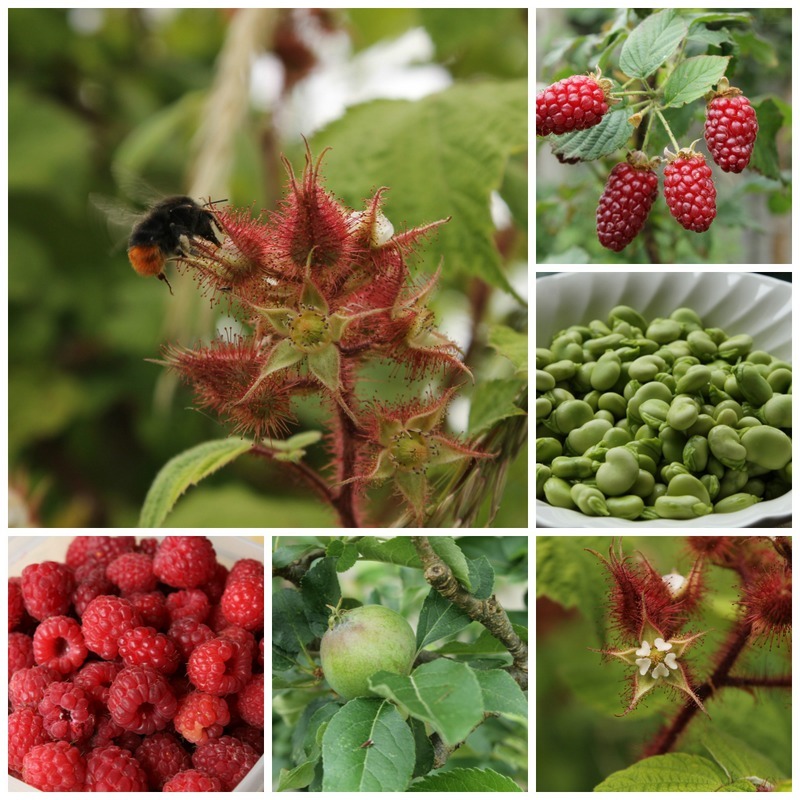 The raspberries are ripening and I've picked masses of tayberries. Leafy things are doing well, especially the weeds, they've been absolutely phenomenal this year. The salad is making up for it though. The wineberry flowers are buzzing with bees which surprised me a bit. They're tiny and its quite hard to spot when they're open, but the bees seem to know. It's good that the soft fruit is staggered slightly otherwise I'd be a bit overwhelmed. Broad beans are doing their usual thing of all being ready at once. I've frozen quite a few although my favourite way to eat them is raw while they're still small and bright green. I've taken out the first lot of sugar snap peas and now it's a wait until the next batch are ready. This time of year is a pleasure, when there's something from the plot or the garden at every meal. 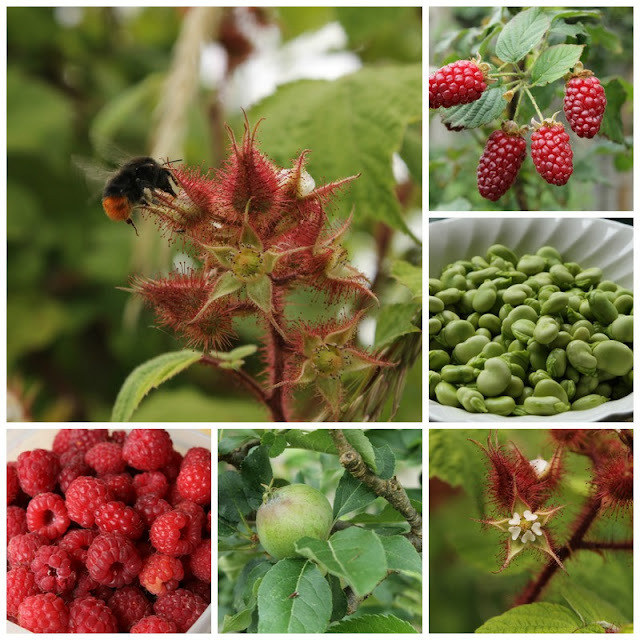 Blueberries or raspberries at breakfast time, handfuls of mixed salad leaves for lunch - sorrel, mustards, rocket and lettuce, then broad beans, courgettes or artichokes at dinner followed by something with the fruit. Everything isn't perfect in the garden, there are no peaches at all this year, most of the cucumber plants didn't survive and the garlic has rust, but there are enough successes and good things to eat to make it all worthwhile. How is your growing going? Ohhhhhh I'm admiring your photos. Your garden is lovely. It's so beautiful! My garden is a disaster this year, too. The weeds are horrible because of an invasive plant called hairy galinsoga. It's so bad now that I'm not going to have a garden outside next year. I'll grow most of what we need in the high tunnel and buy a few things from a local farmer. Thank you for sharing your garden with us. It's very inspiring! What a shame about your strawberries at the allotment but I'm glad you still have managed to grow them in the garden and have some to enjoy. Our wineberry is looking better than it has ever looked so maybe we will get more than just a small handful of berries this year. Yes, mine took two or three years to get well established. Now it's going from strength to strength. Oh well done CJ. As long as the triumphs outweigh the tragedies and you are enjoying the fruits of your labours you are winning. Loads of strawberry and raspberry recipes in yesterday's Guardian Cook section including raspberry and lemon verbena sorbet which I will definitely be making. It is so strange how mice cache the unripe strawberries. This happened to me a couple of years ago which is why I moved to growing ever-bearing strawberries as well as the main summer crop, but it hasn't happened since. There are weeds a plenty and the puppy seems to be digging up anything we might have eaten. I've managed to salvage some courgettes and lettuce though! Despite your allotment strawberries it sounds as though you are reaping a lovely harvest from your garden. What a great harvest, we don't grow masses but the little we do grow is doing well. Still no sign of a tomato yet. Beautiful photos CJ. Those tayberries are amazing! We don't have those around here, but I just looked them up - a cross between red raspberries and blackberries, sounds interesting. Looks like you're well on top of things CJ. It's starting to get back on track here, even if I am still living in chicken wire Fort Knox. How wonderful it was to eat mange tout with lunch today which half an hour earlier were still growing on the plants. Very pleased I've found another wonderful blog! The photos are excellent and I love reading about other peoples experiences. Like everyone else I'm spending so long dealing with weeds. I've had plenty of problems this year but growing food is still enjoyable. Keep up the good blog. Sounds like the success outweigh the disasters. Can you think of it this way, you have made some very little mice very happy. While other gardeners have courgettes in surplus we have yet to succeed in growing them in the 7 years we have lived here, but this year one plant has blossoms so I am hopeful we will at least get a few. We have some tomatoes forming and the rainbow chard is still alive as is one basil plant. The little apple trees are burdened with fruit! 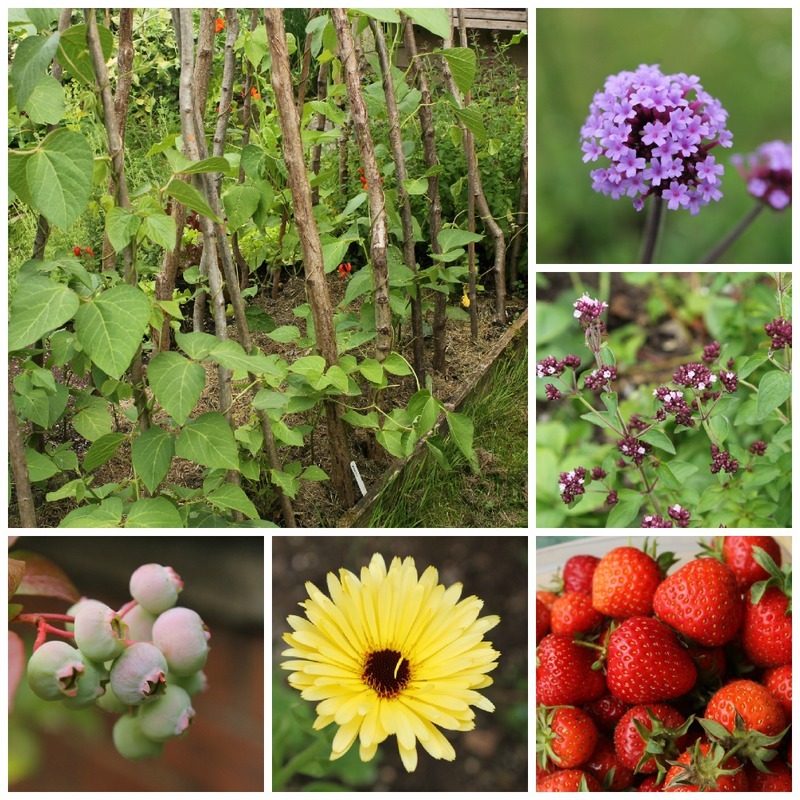 Love these images of your garden/allotment. 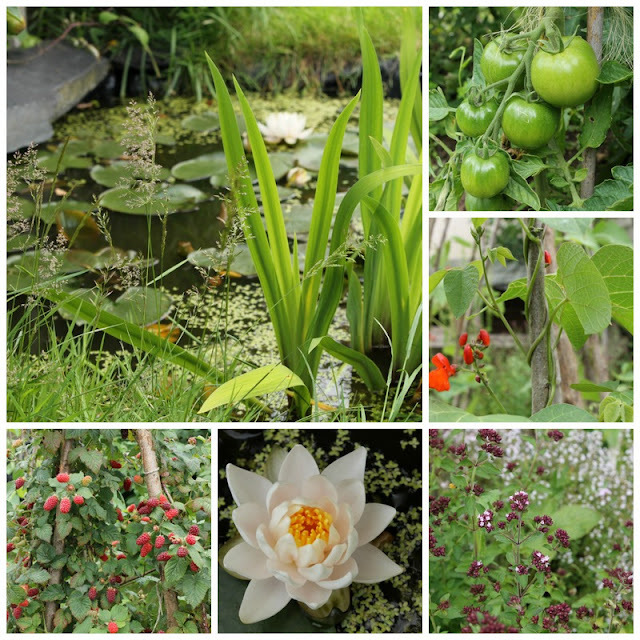 Especially the water lily. It all looks fabulous, CJ, so very productive. What a lot of berries. It's a shame about the strawberries, sounds like they'd be better off in the garden rather than the allotment. My favourite broad bean thing at the moment is to whizz them with some feta cheese to make a dip. i won't lie, i'm very envious. we are, again - although even worse than last year - drought-ridden. i'm at the point of prioritizing what gets watered..just wanting to keep the blackberry bushes and strawberries alive...with no expectation of fruit. i actually had to pinch off the strawberry flowers so that the plant didn't use the energy to make fruit. true story. horrifying, but true. we always have to take the good with the bad in gardening... mice, grr!! your other berries though do look rather juicy. 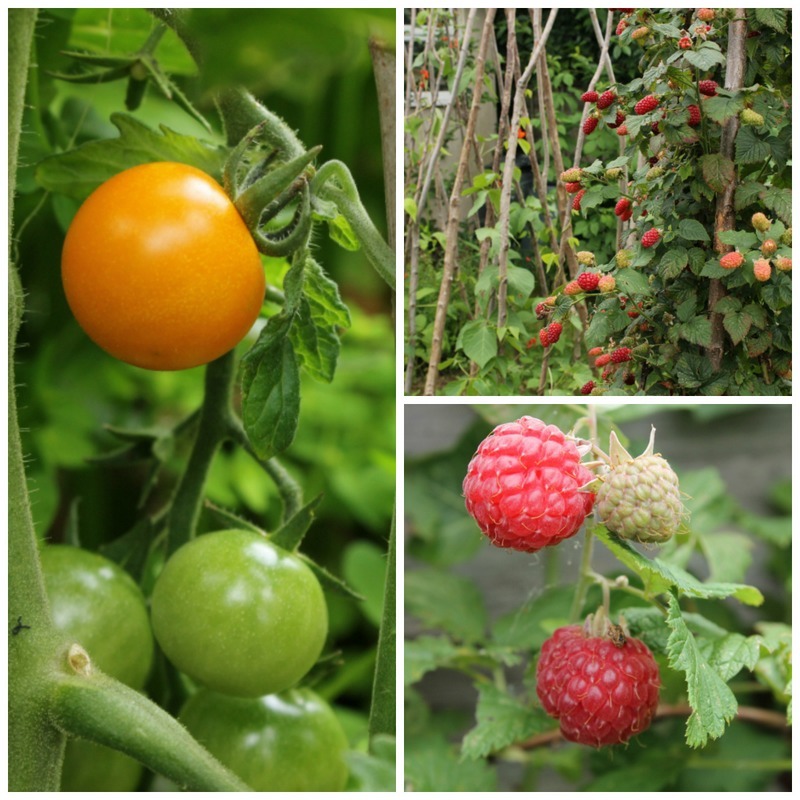 and being able to eat something from your garden at every meal - it's what we do it for, isn't it? You win some, you lose some in this gardening thing of ours. Glad to see you're winning more than losing. My foes are slugs and badgers - I fail every time! But I'm learning to live with them rather than battle with them. Or trying to. In the meantime we have lots of some things and none of others, but that's fine. I love your photos, especially the cool peaceful pond. Thanks! Beautiful photos, CJ. It looks like you've had a lot of success so far. I especially love the look of your different kinds of berries. I wish I could grow them here. I do have a strawberry patch but I have to keep my hens out of it because they will decimate it in seconds. I think you're doing really well this summer and you will have a wonderful harvest soon. I hope you have a good week ahead. CJ, looks like you are been rewarded with very yummy treats for all your hard work. Wishing you a week filled with much much more yummy! Thanks for the lovely photos, they made me dream of balmy sweetly scented summer while we hibernate from cold driving rain, wind and sleet. Beautiful photos, CJ! Yes, gardening is always a mixed bag. And the weeds always get the award for "best crop." While you battle with the mice I'm fighting with the squirrels and birds. My new strategy is to start my plants under a mini cloche, then remove it once I think they are big enough the local wildlife won't be interested. I've never heard of wineberries. I'll have to do do some Googling to see what they are. Gosh, it all looks so....can't think of the word...unblemished. Gardening's very hit and miss here (more miss than hit, I'd have to say) but I'll keep trying. And keep gazing with envy at your gorgeous pictures. Abundance indeed! I wish we had a fraction of what you've got - but it's more failures than successes this year. Doesn't help that the garden is prone to flooding after a heavy shower or two (and it doesn't seem to do much else at the moment). Alpine strawberries have been a flop, as has the sweetcorn and dill. Fruit bushes: all foliage and no berries (we don't add anything to the soil so no idea what's going on there). We do have lots of potatoes. And foxgloves. Not that the latter are in any way edible. All looks good to me. I love the rustic supports you use for your beans, so much nicer than bamboo poles.